If you monitor the Windows Task Manager, by loading it with Ctrl-Shift-Esc for instance, or if you use a more advanced process monitor like Process Explorer, you may have noticed already that Runtime Broker is not active all the time. If you watch more closely, you may notice that it is linked somehow to Universal Windows Apps (those installed from Windows Store, that came with the operating system, and sideloaded apps). The following guide offers information on the process, and tips on how to resolve the high CPU load that it causes sometimes. 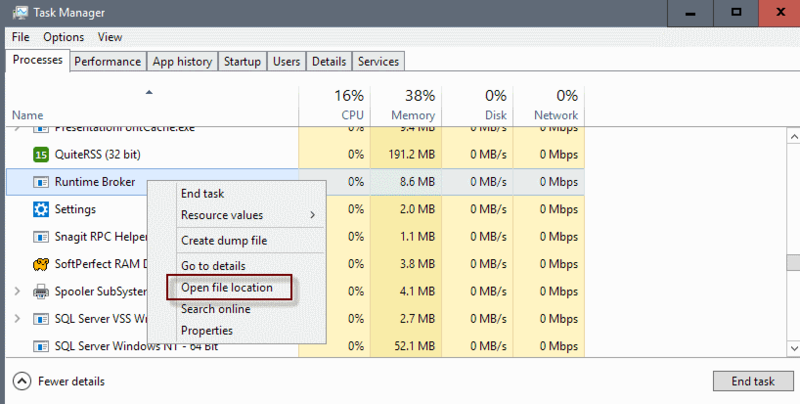 You will find Runtime Broker listed under processes, and under details when you open the Windows Task Manager on Windows 10. 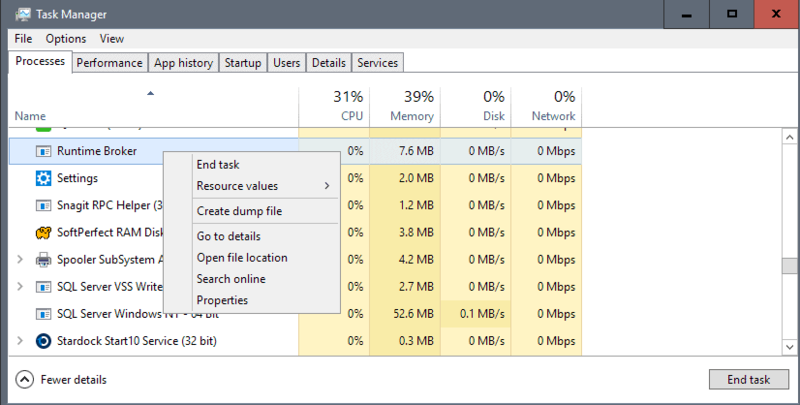 Note that the Windows 10 Task Manager separates processes into apps and background processes. Depending on the status of Runtime Broker, you may find it listed under either one there. For a clearer picture, switch to details and locate it there. Since Runtime Broker is linked to Universal Windows Apps, you will notice that it becomes active whenever you start one of these applications on your device. To provide you with a little bit more detail: The main task of Runtime Broker is to check if these applications have declared all the required permissions, and to inform you about it. So, it acts as a security middleman between the app and your data and hardware on the device. Reports started to come up as early as 2015 that Runtime Broker was causing high CPU loads on Windows 10, and as early as 2012 that it was using a lot of memory on Windows 8. Microsoft suggests to kill the Runtime Broker Process if it uses more than 15% of memory. If your RAM use is high and your PC is running slowly, an app may be the cause of the problem. Press Ctrl+Shift+Esc to open Task Manager and then, on the Processes tab, check to see how much memory Runtime Broker is using. If it’s using more than 15% of your memory, you probably have an issue with an app on your PC. To stop Runtime Broker from using so much memory, select Runtime Broker in the list, select End task to close Runtime Broker, and then restart your computer. Right-click on Runtime Broker in the processes list. Select End Task from the context menu that opens up. This is only a temporary solution, as Runtime Broker will launch again the next time a Universal Windows Application is started. Any feature of Windows 10 that is powered by a Universal Windows Application, leads to the execution of the Runtime Broker process. This explains why you may see the process thrashing the hard drive, causing high CPU load, or high memory usage, even though no Windows application was started at the time. One common fix is to disable the application that is responsible for displaying tips and suggestions to Windows users. Use Ctrl-I to open the Settings application on Windows 10. Switch to System > Notifications & Actions. If the app is not essential, uninstall it and be done with the issue. If the app is essential, check for updates. If an update is available download and install it to see if it resolves the issue. If that is not the case, try uninstalling the app, and installing it again after a PC restart. Some applications may run in the background. This means that they will continue to run even if they are not in the foreground. Toggle any application that you don’t want to run in the background to off. This may remove functionality such as the application’s ability to send notifications or stay up to date. If you search the Internet for fixes for Runtime Broker issues, you will end up with dozens of suggestions on resolving the issue. Change the local screen background from using Windows Spotlight (which changes background images frequently) to Picture. You do so in the Settings application under Personalization > Lock Screen. Disable P2P update functionality under Settings > Update & Security > Advanced Options > Choose how updates are delivered. Turn the option to off there. Basically, anything else that runs as an application may cause the issue. Last but not least, you may also want to check whether Runtime Broker is a legitimate Windows process, or if it is a virus. The easiest option to find out is to check if RuntimeBroker.exe is located in c:\windows\system32\. Locate the Runtime Broker process there under processes. Right-click on the process, and select the “open file location” menu item. If it is, go to Virustotal and upload the rogue file there to have it checked. This entry was posted on Thursday, April 6th, 2017 at 10:18 am	and is filed under tech tips. You can follow any responses to this entry through the RSS 2.0 feed. Both comments and pings are currently closed.